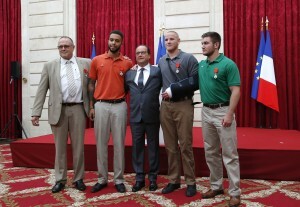 Three Americans and a Briton who helped prevent a gunman’s attack on a high speed train in Paris were awarded France’s highest honor, Knights of the Legion of Honor. Monday morning, French President François Hollande welcomed U.S. Airman First Class Spencer Stone; Alek Skarlatos, a specialist in the Oregon National Guard; and their friend Anthony Sadler; along with Chris Norman, a British consultant to the Élysée Palace. Hollande pinned a medal to each man’s shirt amid applause at the ceremony at Elysée Palace. He said the men had given a lesson in courage. “We cannot be afraid as long as we have individuals like this in our midst,” Hollande said. The four men are now regarded as international heroes after taking down a heavily armed gunman on a train carrying over 500 passengers. A man described as a U.S.-born academic Mark Moogalian and a French citizen who wishes to remain anonymous helped subdue the man. They will be honored at a later time. Moogalian was the first to disarm the 25-year-old Moroccan Ayoub el-Khazzani of his AK-47 when Khazzani pulled out a pistol and shot Moogalian, puncturing his lung. The three Americans sprang into action and helped disarm Khazzani who then brought out a boxcutter and stabbed Stone. Stone, who has visible wounds to his eye and his arm in a sling, said it seemed like the gunman kept pulling more weapons left and right. Eventually the men brought Khazzani down and tied him up to restrain him. Khazzani’s lawyer stated that this was not a terrorist attack, rather the act was an attempted robbery with guns the man found in a public park. Khazzani is currently being questioned by French counterterrorism police.